If you were wondering why Ryan Pressly was not used in the 10th inning of Friday night's loss to the Red Sox, well, there was a good reason. Moments after the game, Ken Rosenthal reported that Pressly was traded to the Houston Astros. Per multiple reports, the Twins will receive RHP Jorge Alcala and CF Gilberto Celestino. Per MLB Pipeline, Alcala is (was?) the Astros #10 prospect while Celestino ranked #15. Jorge Alcala will turn 23 tomorrow. The Dominican native has 82 strikeouts in 79 1/3 innings for the Astros High A and AA affilaites. He is the #8 Astros prospect per Baseball America. Some reports indicate he is another hard-thrower who can hit 100 mph. Celestino is 19, also from the Dominican. He has played in the short-season New York/Penn League and played in three games at AA earlier this year. He has hit a combined .299 with eight doubles and four homers. Also 14 steals in 36 games. 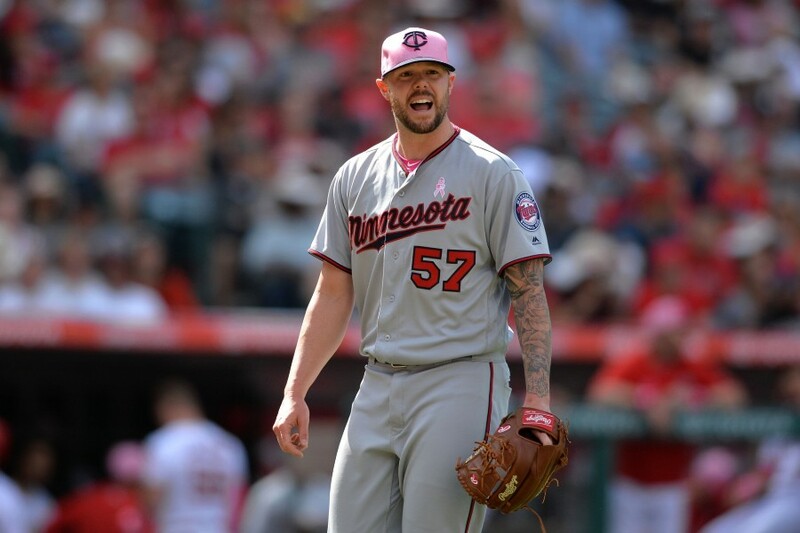 Ryan Pressly was said to be the Twins player that almost all contending teams were asking about. His velocity and spin rate made him, along with having one more year of arbitration, made him intriguing to a lot of teams. The former Twins Rule 5 pick has really made strides in 2018 after looking the part and showing glimpses over his years with the Twins. Pressly is a Texas native, so he's kind of heading home and will fit into an already strong Astros bullpen. So anyone want to speculate how valuable spin rate is? How high on the prospect list does it have to be to satisfy the Belisle Bomb he just gave up? If we are selling, and thereby giving up on the season, there’s definitely not point to let Belisle have a kid’s roster spot, right? To me this suggests that there is a good chance Kyle Gibson gets traded as well. If the front office was willing to move one of the 2019 controllable players, you would have to image that both of them would be on the table. Still, they shouldn't settle on a deal for Gibson unless they get a great offer. Good trade again by the FO.Alcala has a big fastball and above slider to go with a good curve and change.Celestino has a 55 hit tool and is only 19.The FO is setting us up nicely for the future.Thank you!! When the dust settles are we’re going to have left is Grossman, Morrison and Belisle. How depressing. Getting a bunch of Guys in A ball that we’ll be lucky to see in 4 years. Celestino has been at Short Season A ball and what looks to be a fill-in job at AA bridging the gap from EST. "Splitting time between high A and AA" is a bit misleading. Looks like Grossman will be tendered a contract next season to be a placeholder as this front office continues to do the opposite of winning. The esco trade sucked! However this pressly one I like! I think trading Gibson means the FO doesn't think the Twins can compete next year either. The order in which these guys move isn't going to necessarily line-up with who we think should be gone.This is going to be news filled weekend.I really hope Gibson stays as well, but you never know who will offer the farm.Falvine gets their opportunity to make a stamp, I guess. My question is are we punting on next year already? with about 10 teams with a better record in the AL, might be the sane move.No? In terms of return? I think the returns on both are decent considering the situations. Pressly was bound to command more with that year of control and profile as a power bullpen piece. 60 games and prayer with a player like Escobar returned solid value, IMO.The pitcher looks like a promising player for sure. I think relievers may be viewed by the FO as more fungible than starters. I’m not yet convinced they’ll deal Gibby. Gotta think the FO thought the return was too good to turn down for Pressly, a controllable asset. As mentioned above, gotta believe if Gibby gets moved then that tells you how the front office thinks about next year. But I'd also add that that means they probably aren't putting too much stock into Buxton and Sano ever become decent players. I like it. Also, I'm happy for Pressly. He gets to go home to Texas and pitch for a really awesome team that's gonna be stoked to add him to their pen. Astros farm system is loaded so their 10th best prospect is still quite a prospect. And Moya on his way to the Twins to take Pressly's spot on the 25-man. Hey Seth, you ever think about taking pre-orders for the Twins Prospect Handbook? Something tells me that's going to be a hot item this offseason. Just a hunch. Wow - Bold - I like it. Grabbing some nice prospects today. When the system overflows, the team will benefit, either through producing quality ML talent, or a surplus to get more ML talent. Celestino was signed by Houston out of the DR in 2015 for 2.5 million. One thing I really hope is that as guys are traded we see players get seasoning at the big league level that need it.This is wehre we need to give Gonsalves, Moya, Gordon, etc. the time to get their feet wet. It'll give us something to be invested in.Along with (hopefully) positive progress from Buxton and Sano. Someone smarter than me: does Alcala need to be on the 40 man next year?